Toy-Terrier — dog, which requires special attention. Toy size and smooth coat require the owner to insulate the pet, not adapted to cold. Remove the measurements: bust, back length (approximate measurements for theTerrier – 28-30 cm and 24 cm). Sweater is with elastic, so the product will be good to stretch. Link the sample to determine the density of knitting: dial the spokes 19 of the loops provarite 25 rows of thread in two additions (two skeins, wool and Alpaca), canvas size – 10 by 10 cm. Knit a sweater from the neck down, dial to the four spokes (4 mm) 48 loops, tie a rubber band 2x2 (two front, two reverse) 4, 5 see Then start doing adding loops: add (do yo) 1 loop in each second pair of purl to make loops 54. Continue to knit to a height of 6 cm, then add 1 loop in the remaining pairs the reverse (work – 60 loops). Continue to knit to a height of 8 cm rubber band 2 × 3 (two front, three inside-out), then close the loop openings. On the spokes at this stage there are 60 loops, 15 on each needle. Close the first two loops on one of the spokes, the remaining 13 loops slide holder for hinge (pin), and then close the first two loops on the next needle and knit the remaining 43 loop rubber band 2x3 (two front, three reverse). Knit back (43 loops) elastic 5 cm, then bring them to mount hinges. Transfer 13 of the front loops on the needle and provarite 5 cm of the front, then connect the front and back, adding two loops where they were closed. Follow the sleeves are typing on the spokes (3 mm) 36 loops along the edge of the armhole, bind 3 cm elastic 2x2, close facial – facial, purl – purl (not to steal), the second tie cuffs. Make tying the bottom of sleeves and edges sweater crochet (6 mm): 1 column without nakida, one air loop, skip 1 cm, then 1 column without nakida, etc. Many believe that clothing for dogs is overkill, considering that the dog is an animal, the body of which is adapted to all weather conditions. However, this is not always the case. 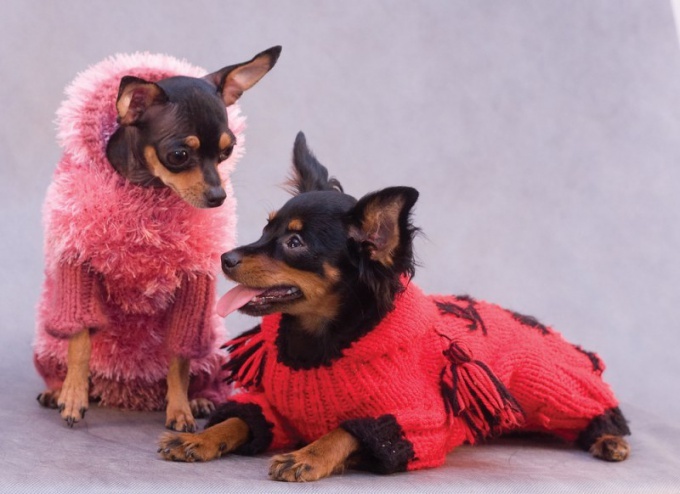 Clothes for hairless dogs, especially small breeds such as the toy Terrier, was not just a whim of the owner, but a necessity especially in cold days. - detachable zipper or buttons for closure. In order to build a pattern jumpsuit for dogs, measure length of back from collar to tail, the girth of the neck (it can be measured by expanding the collar) and chest girth. Start with what link the sample of 10x10 cm, and calculate how many loops obtained in 1 cm and Then count how many loops for stacked series. For example, in 10cm sample turned 30 stitches, therefore, an inch is 3 loops. If the volume of the neck 22 cm, so you need to score 66 loops. Knit, starting with the neck. Dial 66 loops and provarite desired length of the neck band 1x1 or 2x2. Next, add a loop so that a number of holes for lace. Do yo under a thread and repeat it after 5-6 loops. An odd number provarite rubber band.
. The number of loops for gain, calculate as follows: calculate the difference between the girths of the chest and neck. This difference multiply by the number of sample loops in one centimeter. Now, connect all three canvases at one provarite 8 inches. Further provarite holes for the back feet, only in this case, you should divide the canvas into three equal parts. Close the loop middle portion. The extreme part knit separately 8 inches (these details would be to close the croup of the dog). Tie the slit on the back with a hook columns without nakida. Tie the sleeve, gradually decreasing the number of loops. Don't make the sleeves too long, otherwise, it will be difficult to wear jumpsuit. Sleeve length 5 inches what you need. The leg tie is slightly longer than 7-8 inches. Sleeve vsheyte in the slots. Sew pant legs. Please note that the inner part of the leg should be left free. Cut the cord 4-5 inches longer neck. On one side slip limiter. Pass the lace into the holes on the neck and fasten the second limiter. Vsheyte the zipper on the back or punch the buttons. You can go for a walk in a new outfit. Clothes for toy Terrier is best to knit the band, then it will always fit, so as it will almost dimensionless. Sweater for dogs is an extremely convenient thing. He will save your pet from the cold and snow, and knitted product, it will be much easier than in the vast overalls, because the sweater does not prevent to move freely, but tight on the body. One problem: to associate such a thing dare not every woman needlewoman. Because the anatomy of dogs is not easy. However, you can easily and quickly knit a sweater, with a little imagination. - yarn (several colors); - the spokes of the right size; - pin; - cm; - hook; - needle. The most important part of quick knit sweaters for dogs – taking the measurements and calculation loops. Exactly put the dog or ask someone to help you. Measure the circumference of the neck (not contracted much), the distance between the feet, the width from the outer base of one paw to the other, the length of the back and tummy (both measurements from the places where they measured the neck). Record the results obtained. To quickly knit a sweater for your dog, and take the necessary samples and calculate the correct loop. In the model, the sweater is mandatory in the binding-gum. It can be no more than 3x3 reps to ensure that you are well stretched. Also applied to the front surface (on the back) and any pattern. Make samples of each mating and count how many loops have 1 cm in each case. Sweater for dogs in this case will consist of several parts. This collar belly (and breast) back. May then tie the legs. Start knitting sweaters for dogs with a neck elastic. Associate needed at the height of the gate and close the loop. Also, the elastic knit "belly". You should now have quite a long detail, because it will go directly from the gate to the chest. When finished, proceed to the back. Please note that the tail back better round, i.e. gradually begin to diminish the loop. When the backrest is ready, make the straps on the bottom. So the product will look nicer. Amperite all the details and proceed to the Assembly. First lock the ring gate. Its seam will be in the middle associated breast-tum. Attach detail and slightly stretch the ends. Thus and sew to the collar. The remaining gate, attach the backrest. Put on the dog and small pieces of yarn to mark armhole legs. Remove clothing from pet and sew to the marked labels. Quickly knit a sweater for a dog can be not only a regular stitch, but also with patterns or colored patterns and inscriptions. Be creative and your pet will be the most stylish around! When taking measurements, consider the anatomical and genital features of a dog. Boys tum is better to make a little shorter.